It’s been a strange evening. I was busy during the day so I wasn’t able to get out early enough for a badger watching session. In my experience, if you can’t get to the sett and be in position before the badgers emerge, it’s very difficult to watch without disturbing them. But it was a fine, warm evening, and being smitten by the Barn Owl I went out again to try and get a picture. There was a concert playing at Woburn Abbey, clearly audible even though it’s some distance away. They started off with opera, which was pleasant to listen to as I sat in a field and waited for the owl. By 9.15pm they’d moved onto more popular stuff, the owl hadn’t appeared and it was getting too dark for photography. As a lady singer belted out Mambo Italiano I called it a day. But it was still a fine evening. Rather than go home, I decided to walk up to the pasture field in the hopes of seeing the badgers out foraging. I’d brought my night vision scope for just this reason. On the way I stopped by the Pine Tree sett. No badgers were in sight, but in the twilight I could see signs of recent activity, which was good. I’ll have to come here and watch properly soon. My hopes of seeing any badgers in the pasture field were dashed by sheep. There are always sheep in this field, but today they were clustered at the top of the hill. They ran away when I approached, as sheep do. I settled down in my favourite spot at the base of the stag-headed oak and listened to the concert in the distance. The sheep, meanwhile, had obviously decided that since I showed no signs of trying to eat them, I might be there to feed them instead. The whole flock started to edge closer. 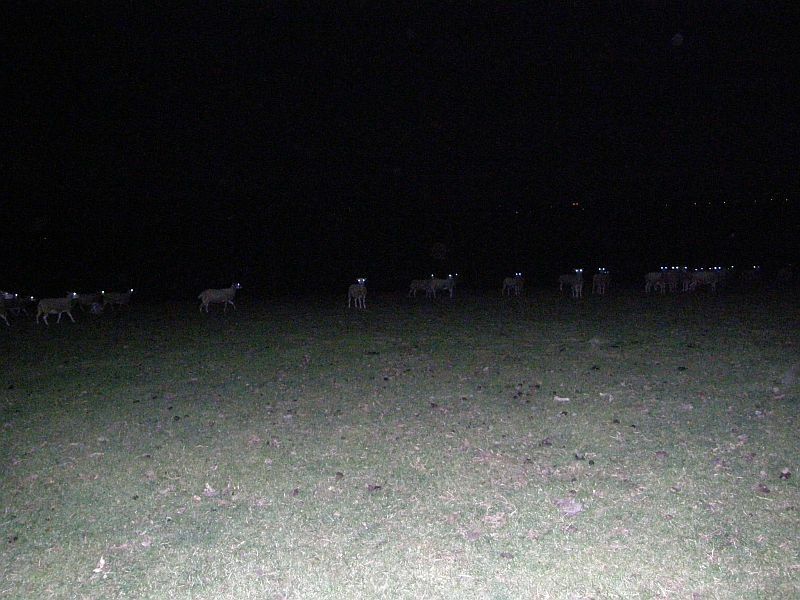 Soon I was surrounded by a perfect circle of 300 or so sheep, all staring at me, as the sound of Strangers in the Night drifted over the field. The sheep stared at me. I stared back at the sheep. It’s at times like this that I start to question my grasp on reality. The sheep were not good for badger watching. My approach depends on sitting still and staying alert for the sight or sound of badgers moving in the field. Impossible when you’re surrounded by hundreds of coughing, belching sheep. Incidentally, sheep coughs sound exactly like human coughs. Once, when camping in the middle of nowhere in Wales, I was kept awake in my tent by what I thought was a crazed stalker with bronchitis. It wasn’t. It was a sheep. I left the oak tree and headed to the brow of the hill for a bit of peace and quiet. It’s a lovely spot, this. It isn’t a particularly high hill, but you can see for miles and miles – the whole of rural Mid-Bedfordshire spread out in front of you. As I sat there, the concert moved towards its finale, Last Night of the Proms-style, with a stirring rendition of Jerusalem. Jerusalem is my favourite hymn. It has the rare quality of making the hairs on the back of my neck stand up. I sat there in the warm summer night and listened, with England’s green and pleasant land before me; the fields and trees and woods and hedges. This was obviously not meant to be a night for badger watching. I turned for home, striding down the hill as the audience joined in with Land of Hope and Glory.